A new piece for Krab Jab Studio's couples show, Marriage is a Work of Art opening this Saturday, Apil 11th at 6pm-9pm PDT. I will also have the drawing available for purchase at the show! Hey guys! I wanted to show you the cover I have been working on for my 2014 sketchbook. The sketchbook will features all of the preliminary drawing I have been working on for my Daughters of Oceanus series this past year. I hope to have it ready for preorder by the end of the year. More images to come soon! The sketchbook will features all of the preliminary drawing I have been working on for my Daughters of Oceanus series this past year. I hope to have it ready for preorder by the end of the year. The latest painting in my Daughters of Oceanus series. See her in person this coming week in the IlluXCon main show! Some working shots of my latest Daughters of Oceanus piece for IlluXCon next week! Another image in my Daughters of Oceanus series has been completed for the August issue of ImagineFX magazine. 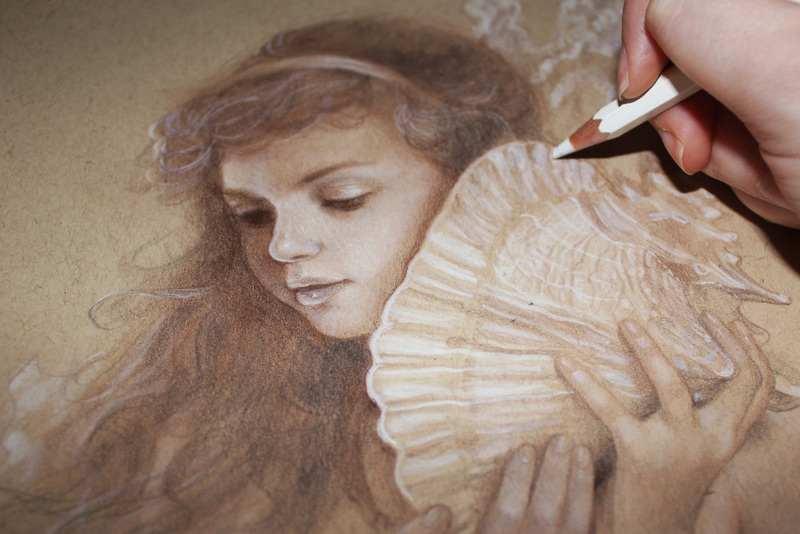 She appears in the FXPosé Traditional art workshop section of the magazine. In the workshop I will be demonstrating techniques that I have used when studying the portrait artists from the Rococo period. I depict a portrait of one of the daughters of Oceanus, Keto, from greek mythology. She is a Naiad Nymph who's name means "sea monster" in ancient Greek. For this portrait I wanted to stay true to the classical portraits of the 18th century while adding a fantastic element, the baby sea dragon, as a twist. You will learn how I create a fantasy portrait using these methods in one of my favorite mediums. While I will be working in traditional oils for this painting, keep in mind that many of the principles I will be showing here can also be applied to other mediums as well. Issues can be ordered here! Issues can be ordered here! Hey guys! I just completed the latest edition to the Daughters of Oceanus series. She will be on display at Spectrum Fantastic Art Live later this week, along with the pencil studies.